While offensive tackles typically receive the most buzz pre-draft, there are two interior offensive linemen that may be the two most NFL-ready OL prospects in the entire class. The first, of course, is Notre Dame Guard Quenton Nelson. The next best, however, just might be UTEP Guard Will Hernandez. Will Hernandez is a 6’3″ 330-pound lineman who has been shooting up NFL Draft boards over the last few months. 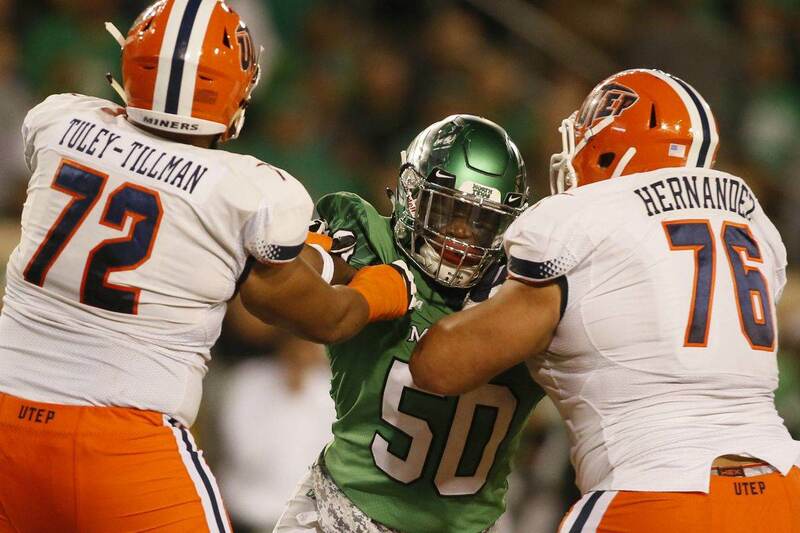 Hernandez returned to UTEP for his senior season in 2017, and enters the 2018 NFL Draft as one of the more experienced prospects in the entire class. The 22 year old earned First Team All-Conference honors during that senior season, as well as Second Team All-American honors from AP. As a pass blocker, Hernandez is rather balanced and patient with his feet and hands. Rarely did I see him lunge towards defensive linemen, or allow himself to get beat due to inefficient or imbalanced footwork. When Hernandez gets his hands inside of you, it’s all over. He is incredibly strong in his punch, and time and time again I saw Hernandez dominate interior defensive linemen and keep them at the line of scrimmage. On occasion, Will Hernandez showed good recovery skills in pass protection. Playing left guard against Texas here, we see Hernandez over-set in his initial power down. This allows the defensive lineman to beat him initially with an outside move. Hernandez recovers nicely with smooth feet and strong hands. Then, once he gets his hands back inside of the defender, Hernandez sinks his hips and finishes the rep really nicely. Will Hernandez continued to impress in his run blocking as well. Consistent throughout his college career, Hernandez didn’t often drive defenders well off the line of scrimmage, but he was always in the right spot. Understanding how to best position his body and utilize his strengths, Hernandez is an effective run blocker. He also plays with a mean streak and looks to finish blocks. Hernandez works very well in double teams, getting hip to hip with the tackle or center and pushing the down lineman into the linebacker’s lap. On this play against Oklahoma, Hernandez seals a running lane nicely, driving the guard out of the gap and sealing what was designed to be a backside cutback lane. The running back reads Hernandez’s block and breaks this one-off for a huge gain. The strength of Will Hernandez’s game is his pass protection. With strong hands and agile feet he had little issues with interior college pass rushers. Will Hernandez is a plug and play offensive guard at the next level, and is currently graded as my OG2 behind only Quenton Nelson in the 2018 NFL Draft Class.